Design reuse involves finding a design that is already complete and reusing it as-is or for a starting point of a new product design. Simple, right? Not always. Design reuse involves finding a design that is already complete and reusing it as-is or for a starting point of a new product design. It has applications in detailed, concept, and tooling design, and design validation. Simple, right? Not always. Design reuse can be a huge time-saver, allowing engineers to dedicate their time and energy towards designing their next great product rather than performing tedious tasks. When mechanical engineers feel overloaded with tasks, design reuse is an ideal alternative to starting a design from scratch. The problem is that design reuse can be discouragingly difficult due to issues caused by technology. The first obstacle is finding designs on operating systems file folders, or PDM systems. While each have advantages and disadvantages, it is generally easiest to find existing designs on PDM systems. Next engineers must tackle how to use and modify the design while relinking files, modifying 3D models and updating 2D drawings. There are a lot of things to remember when attempting design reuse, and it might seem mind-boggling. However, it doesn’t have to be. The benefits of design reuse are great, and mechanical engineers that know how to reuse designs and the accompanying deliverables have more time to explore innovations and ideas. 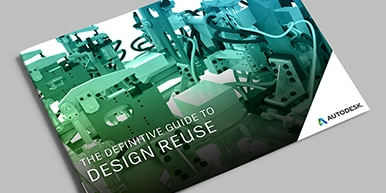 Applications of design reuse cover Detailed Design, Concept Design, Design Validation, and Tooling Design. Download the eBook to learn how to reuse existing designs with fewer complications and better results.